Paul Richard “Richie” Furay was born in 1944 in Yellow Springs, Ohio. He is a singer, songwriter, and Rock & Roll Hall of Fame member. Furay is best known for forming the band Buffalo Springfield and later forming the band Poco. Prior to forming Buffalo Springfield, Furay was a member of the nine member group called the Au Go Go Singers who performed at New York City’s Cafe Au Go Go. In 1967, one of the production engineers for the album, Buffalo Springfield Again, was Jim Messina. He was the producer for the bands final album in 1968, Last Time Around. Messina was born in Maywood, California, in Los Angeles County, in 1947. While still 16 years of age in 1964, Messina recorded his first record credited to Jim Messina And His Jesters, primarily a surf guitar album. By the age of 19 Messina was a recording engineer and at the age of 20 he played bass guitar on two of the tracks on Buffalo Springfield’s Last Time Around. During this time Messina got to be friends with Ritchie Furay. When Buffalo Springfield disbanded part way through 1968, Furay and Messina formed Poco. Another person to join Poco was Rusty Young. He’d been hired to play steel guitar on “Kind Woman” on the Last Time Around album. George Grantham became the bands drummer. 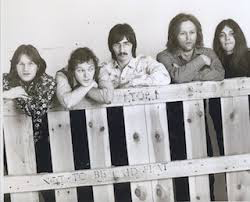 After the release of Picking Up The Pieces, Poco’s fifth bandmate, Randy Meisner, quit the band and formed a band called The Eagles. The musician who’d been Poco’s second choice, Timothy B. Schmit joined Poco on bass guitar and vocals. Schmit, born in Oakland in 1947, had been part of a band called New Breed who had a regional hit in California in 1965 called “Green-Eyed Woman.” The song climbed to #1 in Sacramento and made the Top Ten in the California towns of Paradise and Yuba City. “C’mon” is a song inviting someone who gets down, sad and lonely to shake it off and love someone they’re connecting with. 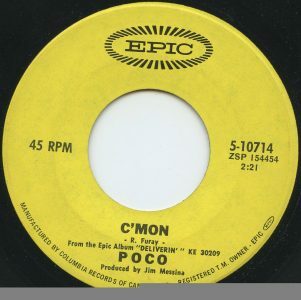 The song laments when communication breaks down and love that is offered to someone is “mistaken.” The upbeat song advises, “I believe that you and I as men should love one another.” Of course, in 1970, although the Stonewall riot in June 1969 had occurred in New York City, the sentiment in “C’mon” is using “men” in reference to all persons. At the time the Youngbloods encouraged everyone to “smile on their brother” in “Get Together.” In 1970, although things were changing and feminism was emerging, songwriters were still penning songs about men, brothers, brotherhood and “man” and intending it as a generic term for all people. Otherwise, “C’mon” could have been adopted as a gay anthem. But this was not understood in the gay community as a liberation song. “C’mon” also celebrated having peace of mind and being satisfied. Why be sad or lonely, the song asked. “C’mon” climbed to #5 in Cleveland, Ohio. It made the Top Ten in Fredonia, New York at #7, and Vancouver, British Columbia, at #9. Poco had to wait until their thirteenth album, Legend, before they had a single that broke into the Top 40 nationally in the USA. In 1979, “Crazy Love” climbed to #17 on the Billboard Hot 100. The album produced a second Top 20 single with “Heart Of The Night.” They went on to release 19 studio albums, 9 live albums and 30 compilation albums. They had one more Top 20 hit in the USA in 1989 titled “Call It Love.” The single came on the occasion of a Poco reunion tour with all of the original members. Ritchie Furay left Poco in 1973 and had a brief solo career with limited success. Eventually, he became a pastor of a church in the Denver area in 1983. Rusty Young retired from Poco in 2013 after 45 years of being on the road. He released a solo album in 2017. Jim Messina continues to perform in concert and has over a dozen concert dates scheduled in February and March 2019. George Grantham was in the band until 1977. He returned for several iterations of Poco reunion tours until he had a stroke in 2009.